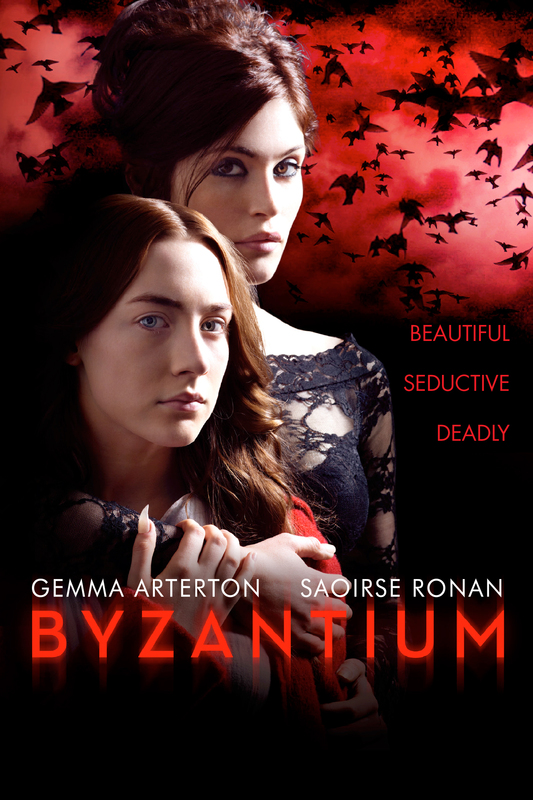 October 22nd: Byzantium (2012) | B-Movie BFFs! This post is the twenty-second in my 31 Days of Vampires! series for October 2014. Director Neil Jordan’s pieces remind me of some of Christopher Nolan’s work; dark, atmospheric, romantic – and a wee bit more clever than first appearances. Despite the deadly nature of the subject Jordan, however, seems willing to leave us with a happy ending – or at least one a little left of a straight-out tragedy. I’m not a sucker for romance but in his bleak, gothic little drawing room dramas I find an optimism that keeps me peeking in on his projects. In the opening minutes of the film we are confronted with two vampires: sisters (or friends…? or mother and daughter…? or lovers…?) who seem almost irreconcilably different, but as in so many of these stories, bound by a tacit and depressing pact. Clara (Gemma Arterton) is outgoing, merciless, sexually-confident, and without scruples (or so it seems). The other vampire Eleanor (Saoirse Ronan) seems brooding, sad, introverted, and squeamish about her dark gift (or so it seems). They are on the run from something (as vampires usually find themselves), and they hastily relocate to a new town, trying to start over. The reasons for the women’s differing temperaments are told – via flashback installments, which is never my favorite story mechanism – and a tidy little vampire story emerges. The film is more style than substance (but hey, that can be okay!) and is populated with beautiful, bewitching talent: the aforementioned Arterton and Ronan, along with Caleb Landry Jones, breathe real life into what at first seem like two-dimensional characters. The question, with regards to a vampire who lives for a couple centuries: can they change? Are the drives and circumstances that molded their pre-vampire life, the ones they keep through their immortal one? Are the motives that enable them to survive the only drives they’ll ever need? Will they adapt, and find some semblance of real love? Ultimately Byzantium is brooding and beautiful. Fans of atmospheric, dark romantic dramas will want to give it a shot.